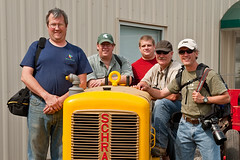 Stuart, DNO_Dennis, Lawrence of Berkley, joseph645, and I hit the Historical Construction Equipment Association's 2009 show for some photo fun. After grabbing a bite to eat we posed for a quick group photo in front of their office and some tractors on display there. I see at least one Canon user in that crowd... good to see!